Manchester City midfielder Ilkay Gundogan has hailed Pep Guardiola, branding him the best manager in the world. The Germany star also reckons all of City's players should feel 'privileged' to work under a coach of the Spaniard's calibre. Guardiola led the Sky Blues to a record breaking, title-winning campaign this year and is now looking to defend his Premier League crown. And Gundogan says he believes that the manager's experience as both a top level player and coach makes him the perfect man to head a team. 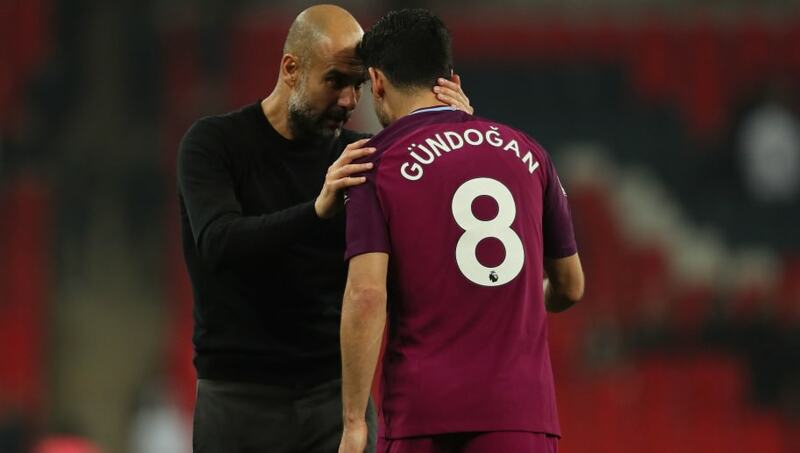 "It's a mix of the fact that he played at a very high level on the biggest stage with Barcelona and the fact that he's just a great manager and can change his point of view from a player's point of view to a manager's point of view, which is sometimes a little bit different," Gundogan explained, via FourFourTwo. "This mix makes him, at the moment, the best manager in the world in my opinion and I think a lot of players would love to play for him as well. Everyone who plays for Man City should feel privileged. "He is able to teach everyone and bring you to the next level. Even when he doesn't say anything, it's just his personality. When you see him, you want to try your best to make him happy. "If you make him happy, you are often happy." City haven't started the season in the manner they would have liked, having already dropped points in a 1-1 draw with Wolverhampton Wanderers in their third league game of the season. They are already two points behind Liverpool, Chelsea and Watford, the Premier League's only teams to have maintained a 100% record so far, yet the gap is very manageable and they're still favourites to come out on top at the end of the term.